Today is not a day for restraint, or dieting, or even my usual “as natural as possible” food. Today, we’re making one of my favorite versions of my absolute favorite indulgence : cheesecake. 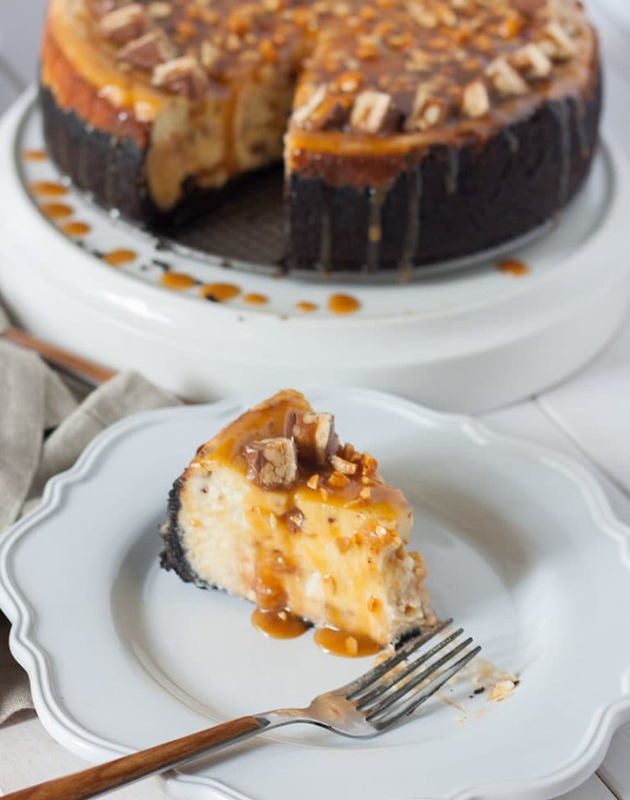 And not just any cheesecake: a Snickers Cheesecake. In a food processor, process the Oreos ( filling and all ) until they are completely crushed. Mix in the melted butter ( I do this in the food processor -- Just pour the butter in and process for a few more pulses until the butter is completely combined ). In a heavy-duty mixer, mix cream cheese, white sugar, and sour cream until combined and smooth. Mix in the three eggs until just combined. Fold in the chopped up Mini Snickers. Bake in the preheated oven for 1 hour. Turn oven off. Let sit for two hours in the oven. To Make the Caramel Topping ( Optional ) : In a heavy-bottomed pan set to medium heat, whisk the brown sugar, half and half, and butter until the butter melts and the entire mixture starts to foam. Slowly whisk the mixture for 3 - 5 minutes, until it thickens slightly. Crushing Oreos: You can do this by hand in a plastic bag and with a lot of aggression, but your crumbs won't be as fine and therefor your crust will not be as solid. 0 Response to "snickers cheesecake"